Who thinks of palms, thinks of exotic countries. Of course, this picture also includes rhythmic music, happy people and good food. 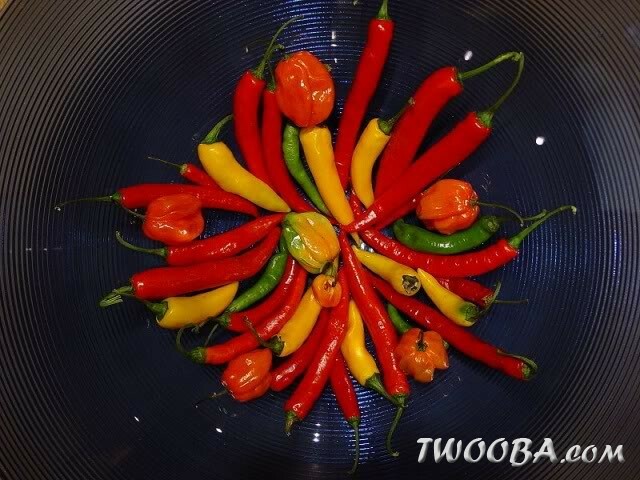 Characteristic of the exotic cuisine are the peppers to spicy dishes. These peppers can also be well cultivated with in Europe. This article will show you the different types, their use and especially their pungency. Before we take off on the different types of peppers, it is useful to understand more about the characteristics of peppers. Peppers belong to the Capsicum genus (nightshade) and are thus related to the potato and tomato. The substance responsible for the pungency is capsaicin. The hottest parts of the pepper are the seeds and the interior ribs. Biting just a bit of the end of the pepper is therefore not a good indication! The capsaicin directly stimulates the warmth senses in the mouth (not the taste sense), giving the idea that the dish is too hot. The pungency of the pepper differs greatly from species to species. In order to determine the pungency of peppers, the Scoville scale was developed. The principle is simple; The pepper is increasingly diluted with sugar water until the pungency has gone. The number of cups of sugar water that was needed is the Scoville unit (SE). A dish is experienced as spicy around the 500-1000 SE. Below you will find an overview of some notorious species. For reference; Pure capsaicin has a pungency of 16,000,000 SE. The black pepper used in the kitchen origins from a whole other family; the Piperaceae. The spiciness of black pepper is due to the chemical “piperine”, not to be confused with the capsaicin characteristic of chili peppers. Peppers contain many antioxidants which protect against cardiovascular diseases, cancer and premature aging. But too many peppers are no good either of course. Have you eaten too spicy? Then the quenching with water will not help! Capsaicin does not dissolve in water but in fat only. Eat some bread or meat, ore drink milk or some alcohol to bring relief. Regularly eating peppers will help you to get a better used to the pungency. 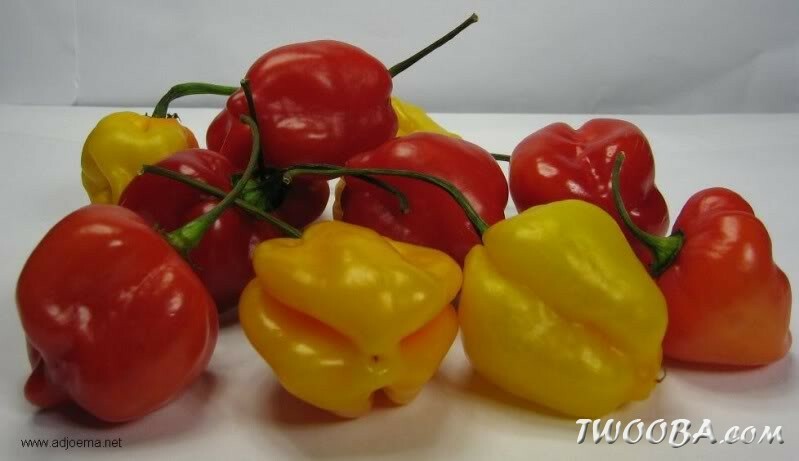 Especially in tropical areas, eating peppers is popular because it would be good to prevent parasitic worm infections and because it promotes sweating which will cool your body temperature. There are many different species of peppers (Capsicum). Originally, peppers are native from South America, but now they are commonly spread. As indicated, there are many differences in pungency, but there are also color variants; Green (usually unripe picked), red, yellow, orange. Below a list of the most cultivated species. • Capsicum pubescens – Rocoto peppers. Seeds are easy to find. In supermarkets and garden centers you will find Chili pepper seeds between the seeds of other vegetables. For the more exotic species you can buy some fresh peppers in a local store. When removing the seeds, do not rub your eyes and wash your hands well afterwards! The seeds may be soaked in water and then sown. Cover the seeds with a thin layer of soil. For the germination, sufficient heat is required; 25-30°C (77-86°F). So you may want to place your container on the radiator or in the conservatory. Of course, the soil must always be sufficiently moist. Within a few weeks, the first leaves will come up. From now on the plants need a lot of light. The temperature may fall slightly; 20-25°C (68°F-77°F). The conservatory is ideal for this purpose. Prevent the seedlings from sunburn. Filtered light is thus recommended. As soon as the seedlings make their second pair of (typical) leaves, they may be transplanted. You can plant them slightly deeper and add soil up to where the first leaves were. The Latin name; Capsicum annuum (pungent annual) is actually not correct. Peppers are not annual, even though they are often used in such a way. It takes a while before the first peppers become visible. But if the plant eventually starts to grow peppers, the fruits grow quickly. The annuum species, which also germinate faster than the Chinese species, generally develop their fruits earlier. 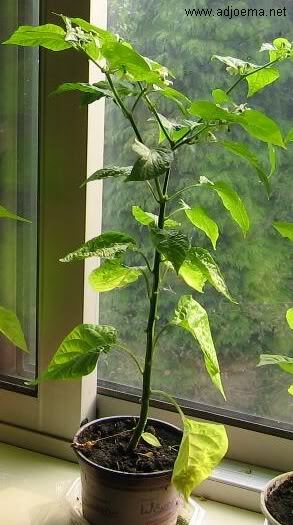 After a while, the pepper plant will be filled with green peppers. First, those peppers become shiny green. In principle, you can already harvest them. The peppers are then less pungent. If you wait a bit longer, up to a month, the discoloration begins to occur. Total discoloration is a matter of just a few days. It turns to black and than its final color. If the pepper is beautifully shiny and bright again, you can harvest it. The image shows the development of the fruit. Question is what to do with all those peppers. There are several ways to process peppers. Below the most useful ways. Immediately after harvesting, you can use the fresh pepper in dishes, cut or uncut. Easy conservation technique. Especially useful for later use in sauces. A popular technique in southern countries is drying. Rip the harvested peppers to a string and hang them to dry. If necessary, a slice can be made in the overall length to prevent fungi. The dried peppers can be ground to powder or served just as the are with dishes. This technique is not only easy but also decorative! The peppers can also be pickled in herbal vinegar. This method is also suitable for long conservation. Attention: Failure in the process can lead to botulism!